The At-Risk After -School Meals Program helps students get the nutritious meals they need in a safe, supervised setting. For many kids, this is their only opportunity to access a healthy meal after the school day ends. Under the Child and Adult Care Food Program (CACFP), the United States Department of Agriculture (USDA) provides reimbursements for snacks and meals served at after-school programs offering enrichment or education activities and that are located in the attendance area of a school where at least 50 percent of children are eligible for free and reduced-price meals. 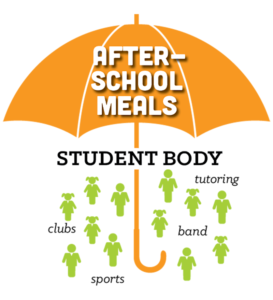 Many after-school programs already feed students using money from their own budgets, but by participating in the At-Risk After-School Meals Program, organizations can use the money saved for additional programming, staff and outreach or to provide healthier meals to students. Additionally, evidence suggests that by providing meals, programs realize an increase in attendance and improvements in student behavior. Whether you’re a parent interested in finding a meals site or an after-school program looking to serve meals through the At-Risk program, check out the Capacity Builder Tool below to help you get started. Contact the site or sponsor directly to inquire about program operating days and times. Parents and community members – don’t see a program in your area? Take Action and request after-school meals in your neighborhood.